The Amcrest 650 TVL Professional Video Security System: Simple, Reliable, Secure. Record professional quality widescreen video through four high resolution cameras, which you can manage along with recordings almost effortlessly: the DVR's robust yet simple software interface makes this system a paragon of friendly engineering. 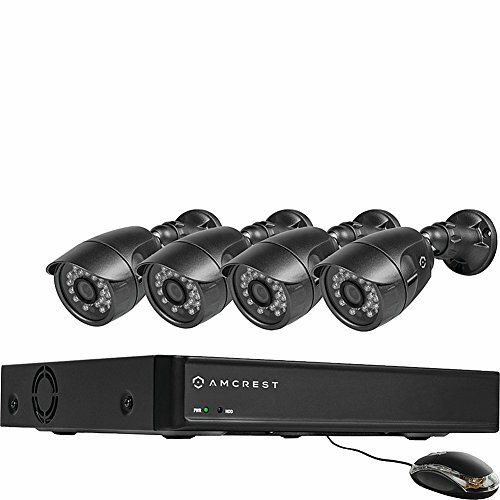 A new cornerstone in the consumer market for private security technologies, the Amcrest 650 TVL Kit is further enhanced by DIY installation, full weather proofing, advanced motion detection, night vision, remote web browser plus smartphone viewing, and exceptional long distance transmit range. All purchases from Amcrest Authorized Retailers include a 1 Year Domestic Warranty plus Lifetime Support, making the quality engineered Amcrest 650 TVL Kit one of the best values available for a video security system purchase. Includes 4 High Resolution 650 TVL IP66 Heavy-Duty Metal Weatherproof Cameras for Excellent Video Quality and Clarity. Pre-Installed 500GB Hard Drive (expandable up to 4 TB) for 6 Days of Continuous Recording at Highest Resolution. Longer Recording Times Up to 30+ Days Available with Use of Motion Detection and/or Lower Resolution Settings. USB backup feature for peace of mind, IP66 heavy-duty metal indoor/outdoor heavy duty metal weatherproof cameras, and powerful IR-LED night vision.